Try to think of your top five video games of all time. Now count the number of them that specifically feature a female-identified protagonist; I bet the number is somewhere between 0 and 1. Heck, I’m a woman and I find myself in the same situation. Nearly half the games I play allow you to choose between male and female. There is only a relative handful of games I’ve played that are led by women. The rest of them comprise of male-dominated titles — for example, Grand Theft Auto V is a top five title for me, but the entire single-player story takes place from the view of three men. The argument could be made that choosing a female character over her male counterpart makes a game with a female protagonist. From a technical standpoint, that statement is true. From a gameplay standpoint, however, one could argue that the experience is the same regardless of gender. Thus, there is a protagonist but they may as well be a blank canvas that doesn’t identify with either gender. In Fallout 4, the story is the same whether you are male or female. The character will move the same, think the same, and act the same regardless of the choice that was made. These thoughts all came to me while engaging in a wonderful conversation with some other Digitally Downloaded writers a few months ago, and I quickly decided that I wanted to spend a year playing games with only female-identified protagonists. Someone smartly talked me down from that daunting task and so here we are: as a compromise, I will play nothing but women-led games for the entire month of September. I want to examine how women are portrayed, how their stories may have been different if they main character was instead male, and why I may have missed so many titles in the past two decades. One side I won’t be tackling this month is why it’s difficult being a woman who plays video games (a LOT of video games). It’s a tough topic that this video covers quite nicely. It turns out that this task isn’t as simple as it seemed in the beginning. My phone and tablet are loaded with games, and it turns out most of them are dominated have no protagonist at all or are male-dominated. Goodbye, Final Fantasy Brave Exvius. I’ll miss you, Tiny Tower and Disney Crossy Road. Pokemon Go… I'm going to come back and find the gyms so much harder. One question keeps popping up as I prepare for September: why? What do I hope to gain by limiting myself? The answer is a bit convoluted. The most obvious sticking point in my mind is that I’m a woman. As such, does that mean I will feel more akin to those who also identify as such? The idea of gender is incredibly fluid. Some people believe it is based on your physical attributes whereas others (such as myself) believe gender is more about a state of mind than what does or does not hang off your body. And if gender is that fluid, will limiting myself just be a case of extreme frustration? I’m concerned I won’t relate to the women I encounter, which is likely completely unfounded. I like to think of myself as a feminist. I am not a vocal one, but I do closely relate to the contemporary ideas of feminism. I’m not talking about the so-called Professional Feminists who stand on their soapboxes all day ranting extreme views; without going into a long-winded history lesson, I can tell you I related to third-wave feminists (from the 1990s and with spillover today) who believe there were failures in the past waves of feminism — namely, third-wave feminists talk a lot about sexuality, try not to over-value upper-middle class white women, and are still concerned with the status of men versus women in society. I’m not here to argue about who is right and who is wrong, but I do wonder if surrounding myself with women for a month will change the way I look at gender in video games. Max (left, Life Is Strange) is my video game equivalent... if I could travel through time, which I cannot (yet). There is also part of me that hopes the women I encounter in the next month are strong and persistent. On a personal level, I find that I am seeking solace from a very hectic time in my life; I hope to find that solace this month, surrounded by my (albeit fictional) peers. Some games I choose to revisit because I know I already relate to the main character: Life Is Strange’s Max Caulfield is approximately 85% me in digital form. We’re both photographers by trade, have left friends behind, have tried to deal with major life changes while feeling excluded from the rest of the world. Others I want to experience for the first time, as I have never explored tombs with Lara Croft or fought an interstellar war as Joanne Dark. These women and their exotic(-ish) locales intimidate me. Why am I intimidated by video game characters? Darned if I know. The last reason for why I will spend this month playing only games with women protagonists is somewhat more personal than the others: I want to explore how women are represented. I want to view games from that past thirty years and ponder what has changed and what has a long way to go. Women seem to be represented as strong heroes more and more, but is that actually the case? Maybe Jade won’t be as strong in Beyond Good & Evil as it appears on the game’s cover — or maybe she’ll be strong in ways I never imagined. Looking back at games I have played and loved, I wonder if women were misrepresented in them and I have just forgotten since it wasn’t relevant to me at the time. Princess Peach will never be that useful in Mario games, but she’s also not the protagonist. I accept that. But I remember adoring Eternal Darkness and I now wonder if Alexandra Roivas is still as strong as I remember or if the game’s psychological elements make her seem weak for whatever reason. Not only that, but Alex often leaps through time and you still wind up in control of men; is the game more unbalanced than I once thought? Related reading: Lara Croft is one of the most recognizable female video game characters. 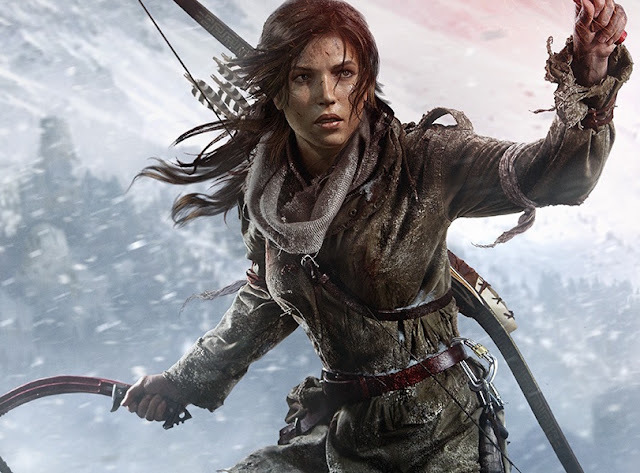 Does she live up to the hype in Tomb Raider: The Definitive Edition? And so, that’s that. I have ideas I want to explore, things I want to think about, and games to play that I never though I would. I welcome any suggestions (from any era in video games). Will I be able to put down my male-dominated go-to games in favour of those with female protagonists? Will women be portrayed justly or unjustly? Could I still consider the “feminist” games I remember as such at this time? September is going to be interesting, that much is true!